We offer a wide range of options at the Mountain House. Our high season is from November 1 to the end of April where reservations are essential to avoid disappointment. Free off-street parking available. For those of you that want your privacy we have single, double, twin, triple and Quadruple rooms. All of your bedding and towels are provided. There is a heater in each room. These rooms are not ensuite. Toilets and showers are close by and shared with other guests. We are committed to the traditional notion of the backpacker lodge and the trampers hut which is all about shared bunk rooms. All bedding is provided and all these rooms are heated. 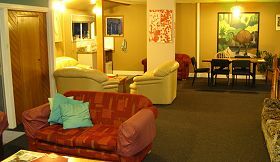 7 bed private room (Shared facilities). The room is split into two seperate rooms with one room having 2 bunk beds (4 beds) plus a single bed, and the other room having a double bed and a single bed. There is a door separating the two rooms. 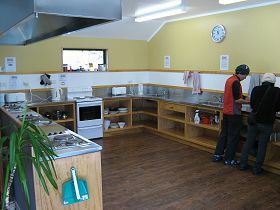 We have found that most groups like to have their own space and place to get together for dinner and relaxing. We recommend that large groups (over 15 persons) take our entire lodge to themselves. We can accommodate groups of up to 27 persons. Email us with your requirements. Groups of up to 7-8 persons - Our family room (1 Double, 6 Singles) may work for you, or a combination of private rooms. Groups of up to 8 persons - Our large bunk room (8 beds) may work for you, or a combination of private rooms. 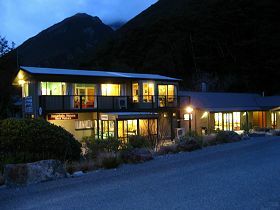 Groups from 15-27 persons - The main lodge may be ideal. 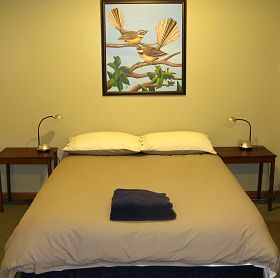 Click Here for the sleeping arrangements in the lodge.